Carluke Rovers chairman Ian McKnight reckons Saturday’s amazing comeback from 2-0 down at Ashfield has saved the club’s season, writes Craig Goldthorp. Trailing by two at the interval in the McBookie.com League Two clash, Rovers produced a much improved display after the break to win 3-2 thanks to goals by Eddie Haley, Sam Biggart and Craig Grierson. McKnight told the Carluke and Lanark Gazette: “At half-time we were thinking our season was over and we had blown any hopes of promotion. 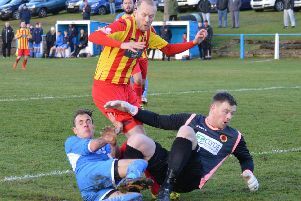 “We found it quite difficult to cope with the slippy ground conditions in the first half. “Although the pitch looked hard, there was a lot of surface water underneath and it was slippery. “Ashfield had adjusted better to it and it took us until the second half to quite literally find our feet. “Craig Grierson ran the second half from right midfield. “We went into the game thinking we had to get a minimum of one point from it. “To get three is a bit of a miracle. “At half-time we looked down, out and dead. The result means that fourth placed Rovers go level with third placed Ashfield in the final promotion slot, with only goal difference keeping the Glasgow side ahead. Carluke, who have 26 points from 15 games, are also six points behind leaders Lesmahagow (32 points from 13 games) and two points adrift of Lanark United (28 points from 11 games). 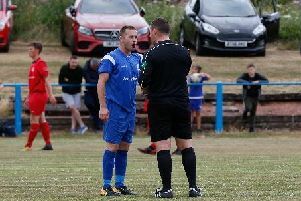 Their win at Ashfield came despite the absences of Ciaran Lafferty – who reported sick on Saturday morning – and skipper Mark Weir who withdrew from the match during the warm-up after feeling that one of his calves was going to pop. Rovers have no fixture this Saturday.